Good morning, my bookish peeps. March is turning into a favorable month for The Book Diva's Reads because of all of the wonderful authors that have stopped by for a visit. Today I'm pleased to host a visit from KL Murphy, author of the Detective Cancini Mystery series: A Guilty Mind, Stay of Execution, and The Last Sin. Ms. Murphy will be discussing series and why we love them. Why Readers Love a Series (and so do I)! I'm often asked by people who learn I'm an author what type of writer I am. When I answer that I write mysteries, the follow-up question is usually, "Is it a series?" Happily, I can say yes. Authors are encouraged to write series by publishers, and there are good reasons for that. First, if a reader likes one book in the series, they will be more likely to buy the others in the series. Second, it's easier to brand an author if they write a series. While some might not like being pigeon-holed, author name recognition in today's expanded publishing world can be critical in attracting long-term readers. I didn't start out writing a series to meet publisher's expectations though. I wrote my first novel, A Guilty Mind, without any idea that it wouldn't be a standalone story. However, what started as a book about a man who'd lost his way and found himself the primary suspect in a murder turned into a story that featured a strong detective with ideas of his own. Detective Mike Cancini was a character I wasn't ready to discard. I liked the character I'd created and more than that, I wanted to take him to other places and let readers get to know him better. In the second novel in the series, Cancini is drawn back into an old case when the man he once arrested for a series of violent crimes is suddenly released based on new DNA evidence. While some are shouting about righting the injustice that has been inflicted on the newly freed man, others are unwilling to accept the new evidence. Their fears seem justified and it is Cancini that the town turns to for help when the crimes start again. 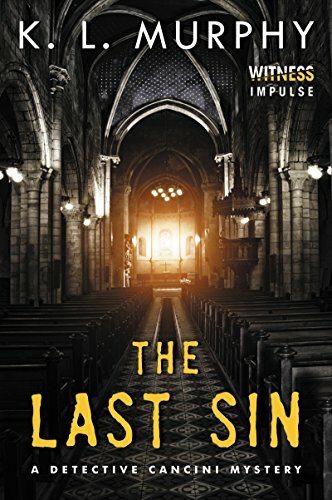 The third novel in the series, The Last Sin, puts Cancini in a tough spot when his oldest friend, Father Joe, finds the murdered body of a friend. Cancini questions what he knows about his relationship with the old priest and is forced to face his fear of losing the man. This is what I love about writing a series and why I think readers love them, too. With each installment, the reader learns more about the recurring characters. Cancini is not an easy man to know and like, but he is unflinching in his resolve to find the answers. Although gruff and often rude, there is compassion under his dispassionate exterior. I know this to be true because I created him! Readers want to watch their favorite characters struggle and grow and fall in love. Those characters become fictional friends, comforting and familiar. Many readers' favorite recurring characters are also mine, though I doubt there is a more lasting and beloved recurring series character than Sherlock Holmes. He has become so known to readers (and TV and movie viewers) that while we know he is only fictional, he feels real to us. There are thriller characters who've also reached that height—Jason Bourne and Jack Reacher are two. Mystery sleuths like Kay Scarpetta, Alex Cross, and Cormoran Strike endure, too, because through a series, we get to know them and, yes, love them. We know that in each novel they will face conflict, but they will ultimately prevail and along the way, take us on a welcome ride. Publishers may have the right idea when it comes to series, but not because they are better for author branding or to capitalize on sales. The popularity of the series has been around since even before authors like Agatha Christie created Hercule Poirot and Miss Marple. This is not to say readers don't read standalone novels—they do and always will—but readers truly enjoy a good series in much the same way they enjoy being with good friends. I'm thankful to all the series writers I know. I think I'll read one now! Detective Mike Cancini has seen some dark days, but his skills are put to the test when a priest is discovered, brutally murdered in a run-down church in Washington, D.C. The man who discovered the body is none other than Cancini's longtime friend and confidant, Father Joe Rossi. The murdered priest, Father Matthew Holland, was adored by the congregation, and it seems clear that this was a crime of opportunity in a deteriorating neighborhood. However, Cancini soon learns some shocking details from the church secretary, and begins to suspect that Father Holland was not as saintly as he may have appeared. This new information leads to a trail of bribes and decades of corruption polluting the church. Cancini must confront his own struggles with his faith and uncover the truth of the conspiracy before more people are killed. The smell of incense lingered in the air, temporarily masking the odor of rotting wood. Father Matthew Holland inhaled. The bitter scent stung his nose. Three years had passed since he'd taken over the church and nothing had changed. Even with the increased attendance and community outreach, the church offerings remained meager. Without offerings—without money—the parish church would die. The priest sat down on the front pew, his robes gathered around his feet. His gaze shifted to the empty pulpit. Two large and colorful plants graced the altar, but they weren't enough to hide the worn carpet or faded paintings, nor could the soft candlelight make him forget the plywood that covered the cracked stained glass. There was so much to do, so much need. He sighed and looked to the cross over the altar. Not for the first time, he asked for forgiveness, for understanding. There would be money now—he'd made sure of that—but at what cost? He'd done it for the church. His pulse quickened and his stomach clenched. Bending forward, he forced himself to take one deep breath after another until the moment passed. He loosened his cleric collar and yawned. The evening's mass had been long and difficult. The drunks in the back of the church had refused to leave, in spite of the old deacons' best efforts. "S'our right to be here," the man with the long, stringy hair had said. His words slurred, he'd leaned forward as though he might topple straight into the next pew. "Worshipin' God," he'd said, although it had sounded like something else judging by the gasps from the congregation. The drunk had pointed a dirty hand toward the altar. "Here to see Father Holland. Tol' us to come anytime." The drunk had swayed again, and his companion had reached out with a strong arm to catch him. Father Holland's mouth had gone dry at the sight of the tattoo on the man's forearm—a black dagger plunged into a white skull. Three drops of blood extended in a single line from the tip of the dagger to the man's wrist. He knew that tattoo, knew what it meant. The awkward moment had passed although not before Father Holland caught the disdain on the faces of the ladies in the choir. Still, none of the parishioners had said a word, all looking to him instead. He'd hidden his trembling hands in the folds of the heavy cassock and swallowed. "St. William is open to everyone, our members and our guests. However, since we are about to have communion, I would ask that everyone who is not singing remain quiet. Guests may come forward for a blessing, of course." He'd been careful to keep his voice steady. Thank the Lord it had been enough. The man with the oily hair had quieted down and then stumbled out during the Eucharist. His friend with the tattoo had stayed a moment longer, then followed. Silence filled the sanctuary now. Father Holland rubbed his hands together and shivered. He could still feel the cold eyes of the tattooed man and the curious glances from the congregation. The man's presence at the evening mass had been no accident and no drunken whim. The message had been clear. After the church had emptied, he'd walked to the corner market and made the call. He'd done the best he could. Money changed everything. It always did. He opened his hand and stared at the crumpled paper with the phone number. He was not a stupid man. Nothing came without a price. He murmured a prayer until his shoulders relaxed and the drumbeat of his heart slowed. His stomach growled, the gurgling loud and rumbly, and he realized it had been hours since he'd eaten. Breaking the quiet, a sound came from the back of the church, a click and a swish as the heavy outer door swung open. He stood and smoothed his cassock. Dinner would have to wait. He strained to see, but the vestibule was dark. "Who's there?" he asked. The door clanged shut and heavy steps sounded on the dingy marble floor. Father Holland replaced his collar and ran his fingers through his hair. There was only silence. The hair on the back of his neck prickled. "Is somebody there?" he asked again. A figure shrouded in black stepped out of the dark. Father Holland stiffened. "Why are you here?" From the shadows, the eyes of the visitor glittered in the candlelight. "I'm a sinner, Father." Father Holland's shoulders slumped. "We are all sinners in God's eyes." Excerpt from The Last Sin by KL Murphy. Copyright © 2017 by Witness Impulse. Reproduced with permission from Witness Impulse. K.L. MURPHY was born in Key West, Florida, the eldest of four children in a military family. She has worked as a freelance writer for several regional publications in Virginia, and is the author of A Guilty Mind and Stay of Execution. She lives in Richmond, Virginia, with her husband, four children, and two very large, very hairy dogs. To learn more about the Detective Cancini Mystery series or future projects, visit her Website , Twitter , & Facebook  pages. This is a rafflecopter giveaway hosted by Partners in Crime Virtual Book Tours for KL Murphy and Witness Impulse. 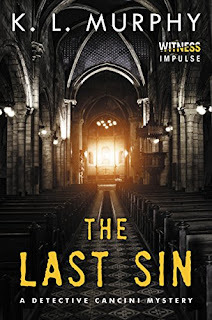 There will be 3 winners of one (1) code for a BlueFire eBook copy of The Last Sin by KL Murphy. The giveaway begins on March 13th and runs through April 16th, 2017. I could not put this book down and looking forward to reading more by this author!